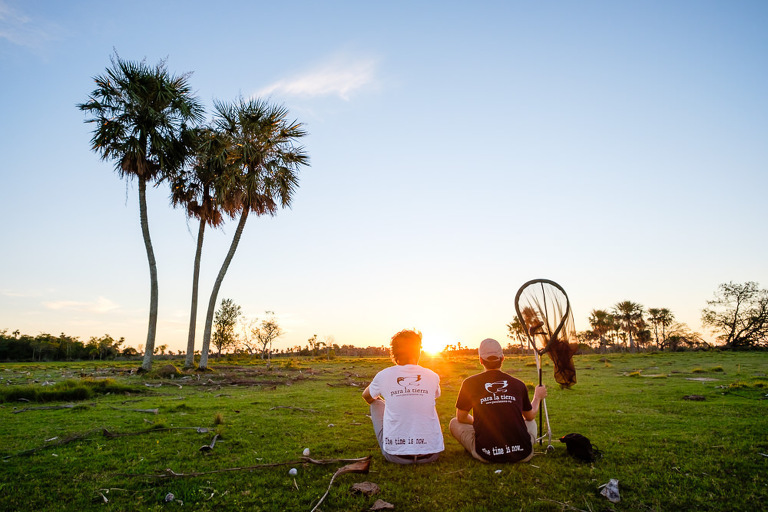 After a long day Jeremy and Joseph enjoy the sunset over the wetlands near Pilar Paraguay. One of the habitats Para La Tierra uses for their research. Para La Tierra protects fragile habitats in Paraguay through scientific investigation, community engagement and environmental education, while ensuring sustainable development. It is hard to capture the magnitude of the Atlantic Forest. Trees that are hundreds of years old and as high as small skyscrapers. Jeremy and Leigh are walking along one of the dense trails of Nueva Gambach next to the sanctuary of San Rafael. Habitats like the Atlantic Forest suffer severely from deforestation. 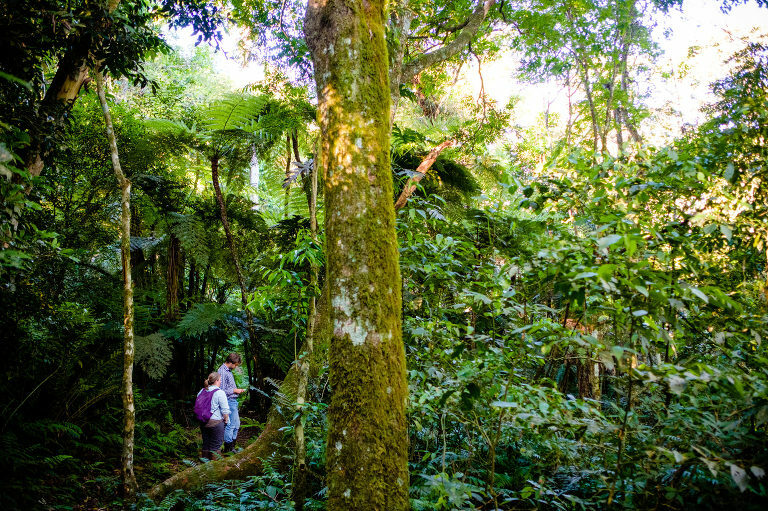 The last remaining part of Atlantic Forest in Paraguay is San Rafael it consist only of 7% of the former expanse. Paraguay is one of the most biodiverse countries in the world. But habitats are endangered. Para La Tierra protects fragile habitats in Paraguay through scientific investigation, community engagement and environmental education, while ensuring sustainable development. Working in the fields as a scientist often means long walks for hours. When there is equipment involved they take the car as close as they can and enjoy the view. Para La Tierra protects fragile habitats in Paraguay through scientific investigation, community engagement and environmental education, while ensuring sustainable development. 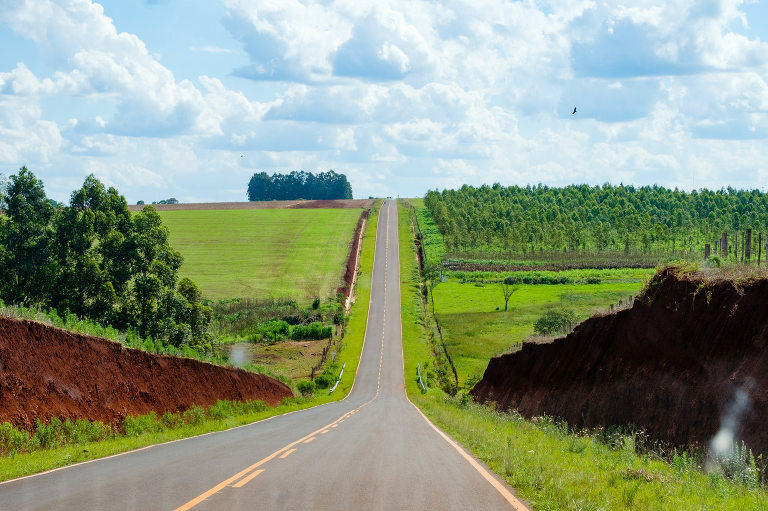 A long road through the paraguayan countryside near the Atlantic Forest San Rafael. On both sides of the road you can see the red soil, indicating that the area used to be Atlantic Forest. Habitats like the Atlantic Forest suffer severely from deforestation. The last remaining part of Atlantic Forest in Paraguay is San Rafael it consist only of 7% of the former expanse. Paraguay is one of the most biodiverse countries in the world. But habitats are endangered. Para La Tierra protects fragile habitats in Paraguay through scientific investigation, community engagement and environmental education, while ensuring sustainable development. A soy field near the Atlantic Forest San Rafael one of the last remaining parts of Atlantic Forest in Paraguay. Deforestation for the cultivation of soy is one of the biggest problems for the endangered habitat. The red soil indicates that the area used to be Atlantic Forest. A truck loaded with wood drives on a street through the paraguayan countryside. Habitats like the Atlantic Forest suffer severely from deforestation. The last remaining part of Atlantic Forest in Paraguay is San Rafael it consist only of 7% of the former expanse. Paraguay is one of the most biodiverse countries in the world. But habitats are endangered. Para La Tierra protects fragile habitats in Paraguay through scientific investigation, community engagement and environmental education, while ensuring sustainable development. A fire is burning in the distant lands in the countryside of Paraguay. Habitats like the Atlantic Forest suffer severely from deforestation. Arson is very common and threatens the wildlife. Paraguay is one of the most biodiverse countries in the world. But habitats are endangered. Para La Tierra protects fragile habitats in Paraguay through scientific investigation, community engagement and environmental education, while ensuring sustainable development. Jeremy and intern Oscar are doing their research in one of the swamps near Pilar Paraguay. Paraguay is one of the most biodiverse countries in the world. But habitats are endangered. Para La Tierra protects fragile habitats in Paraguay through scientific investigation, community engagement and environmental education, while ensuring sustainable development. Getting wet is a big part of researching the wetlands and swamps near Pilar. But the scientists and interns working at Para La Tierra are all passionate and excited about their work and trying to make their part of helping with Conservation of endangered habitats in Paraguay that they do not mind and take it with big smile like Jeremy after his research in the swamp. Paraguay is one of the most biodiverse countries in the world. But habitats are endangered. Para La Tierra protects fragile habitats in Paraguay through scientific investigation, community engagement and environmental education, while ensuring sustainable development. Intern Marco from Italy is looking for monkeys in trees in Pilar. He spends several hours a day watching them and collecting data concerning their behaviour. Hundreds of howler monkeys live in the area. Para La Tierra protects fragile habitats in Paraguay through scientific investigation, community engagement and environmental education, while ensuring sustainable development. Intern Marco assists Rebecca, the Primate Project Leader with her research. She is doing her Phd about monkeys and Conservation Science. Hundreds of howler monkeys live in the area. Para La Tierra protects fragile habitats in Paraguay through scientific investigation, community engagement and environmental education, while ensuring sustainable development. Fisherman are trying to catch fish in the Rio Paraguay. On the other side of the river is Argentina. Para La Tierra wants to establish Paraguay and Pilar as a destination for Eco-Tourism, showcasing the great landscape and biodiversity of the area. Para La Tierra protects fragile habitats in Paraguay through scientific investigation, community engagement and environmental education, while ensuring sustainable development. A tree in Pilar has a sign on it saying “I am your friend. Do not destroy me.” Pilar is compared to the rest of Paraguay more open to face ecological problems says Joseph Savary, deputy director of Para La Tierra. Mainly because of the biologists Andres and Julio Contres who started education about ecological problems in Pilar, but passed away a few years ago. Para La Tierra tries to tie on on the first achievements and take them further. Para La Tierra protects fragile habitats in Paraguay through scientific investigation, community engagement and environmental education, while ensuring sustainable development. The sunset over the Rio Paraguay is beautiful. On the other side of the river is Argentina. Para La Tierra wants to establish Paraguay and Pilar as a destination for Eco-Tourism, showcasing the great landscape and biodiversity of the area. Para La Tierra protects fragile habitats in Paraguay through scientific investigation, community engagement and environmental education, while ensuring sustainable development. A lot of the work happens in the lab in the house where employes and interns live and work together. Here director and founder of Para La Tierra, Karina Atkinson examines a dead snake. Para La Tierra protects fragile habitats in Paraguay through scientific investigation, community engagement and environmental education, while ensuring sustainable development. Karina Atkinson is the founder and director of Para La Tierra. She studied Genetics at Glasgow, but realised she did not want to do labwork for the rest of her life. After an internship at ProCosara in Paraguay she fell in love with the pace of life and the simplicity of living on a field site and saw the opportunity of making a difference and moved to Paraguay permanently in 2010. She hopes that Para La Tierra will continue to grow and and be a training ground for young and curious minds. Para La Tierra protects fragile habitats in Paraguay through scientific investigation, community engagement and environmental education, while ensuring sustainable development. Hundreds of howler monkeys live in the area of Pilar and their behaviour is part of the research of Para La Tierra. Para La Tierra protects fragile habitats in Paraguay through scientific investigation, community engagement and environmental education, while ensuring sustainable development. Jeremy from Para La Tierra (PLT) catched a dragonfly on a fieldsite near Pilar Paraguay. He is noting down all its specifics to establish a better understanding of the habitats that PLT is studying. Para La Tierra protects fragile habitats in Paraguay through scientific investigation, community engagement and environmental education, while ensuring sustainable development. 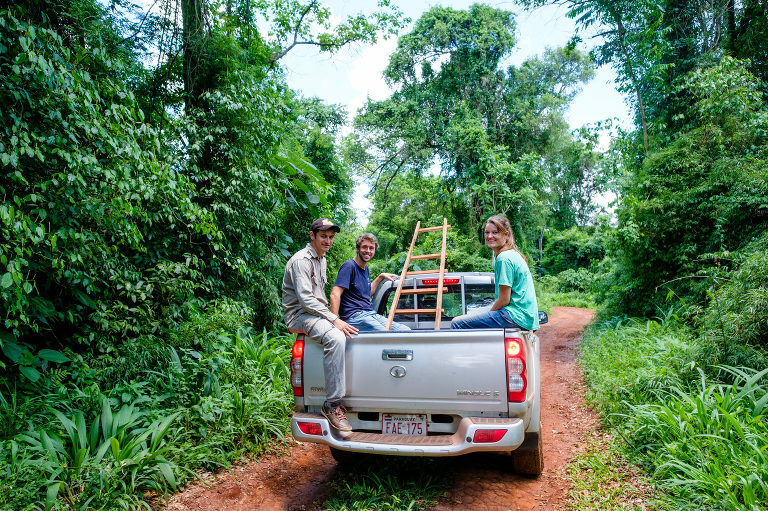 Jeremy and Joseph from Para La Tierra are setting up traps in a habitat near Pilar Paraguay. With their research they try to get a better understanding of the habitats in Paraguay, since there has not been a lot of scientific work in this area. Para La Tierra protects fragile habitats in Paraguay through scientific investigation, community engagement and environmental education, while ensuring sustainable development. Jeremy is trying to catch dragonflies or butterflies on a fieldsite near Pilar, Paraguay. All the findings from studying them are noted and help with a better understanding of the different habitats in Paraguay. Paraguay is one of the most biodiverse countries in the world but its habitats are endangered because of deforestation, cultivation of soy and other agriculture. Para La Tierra protects fragile habitats in Paraguay through scientific investigation, community engagement and environmental education, while ensuring sustainable development. Joseph and Jeremy are examining the ground in a certain perimeter that they marked before. All their findings are noted and help with a better understanding of the different habitats in Paraguay. Paraguay is one of the most biodiverse countries in the world but its habitats are endangered because of deforestation, cultivation of soy and other agriculture. Para La Tierra protects fragile habitats in Paraguay through scientific investigation, community engagement and environmental education, while ensuring sustainable development. Sunset over the wetlands near Pilar Paraguay. One of the habitats Para La Tierra uses for their research. Para La Tierra protects fragile habitats in Paraguay through scientific investigation, community engagement and environmental education, while ensuring sustainable development. Jeremy and Joseph from Para La Tierra are looking for frogs in the wetlands near Pilar Paraguay after the sun went down. Even though you can hear hundreds of them it is not always easy to find them. Para La Tierra protects fragile habitats in Paraguay through scientific investigation, community engagement and environmental education, while ensuring sustainable development. Jeremy from Para La Tierra is looking for frogs in the wetlands near Pilar Paraguay after the sun went down. Even though you can hear hundreds of them it is not always easy to find them. Para La Tierra protects fragile habitats in Paraguay through scientific investigation, community engagement and environmental education, while ensuring sustainable development. Learning about nature and animals can be fun, especially when you are equipped with big magnifying glasses. A big part of Para La Tierras work is education. Despite their intern program they started an Eco-club for young children from Pilar. Joseph is very passionate abou teaching them about endangered species, ecological problems and how you are supposed to treat nature and animals. But also playing together and having fun exploring the outsides is a big part of it. The kids call him lovingly “the professor”. Para La Tierra protects fragile habitats in Paraguay through scientific investigation, community engagement and environmental education, while ensuring sustainable development. Learning about nature and animals does not have to feel like school but can be fun. While having an educational part Eco-club is also about playing together. After exploring the area next to the river the kids from the Eco-club play a game together. A big part of Para La Tierras work is education. Despite their intern program they started an Eco-club for young children from Pilar. Joseph is very passionate abou teaching them about endangered species, ecological problems and how you are supposed to treat nature and animals. But also playing together and having fun exploring the outsides is a big part of it. The kids call him lovingly “the professor”. Para La Tierra protects fragile habitats in Paraguay through scientific investigation, community engagement and environmental education, while ensuring sustainable development. Kids of one of the primary schools in Pilar learn the differents stages and needs of trees before planting trees in front of their school together with Para La Tierra. A big part of Para La Tierras work is education. Despite their intern program they started an Eco-club for young children from Pilar and reach out to local schools. Para La Tierra protects fragile habitats in Paraguay through scientific investigation, community engagement and environmental education, while ensuring sustainable development. Kids of one of the primary schools in Pilar are planting trees in front of their school together with Para La Tierra. A big part of Para La Tierras work is education. Despite their intern program they started an Eco-club for young children from Pilar and reach out to local schools. Para La Tierra protects fragile habitats in Paraguay through scientific investigation, community engagement and environmental education, while ensuring sustainable development.